Digital Dream Labs, maker of Puzzlets hands-on early childhood games, today announced a new tactile programming interface developed using Wonder Workshop’s API that will allow young learners to program educational robots to move, light up, or make sounds by using physical manipulatives; providing students as young as four with the opportunity to explore coding and robotics in early childhood classrooms. Puzzlets are physical tiles that young children can manipulate with their hands. 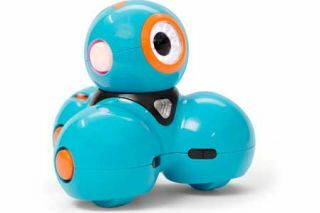 By connecting physical tiles wirelessly to Dash, the educational robot, young learners are able to experiment with basic robotics programing, without the use of a screen. Colorful icons are used to translate coding concepts, making computer science accessible, even for pre-readers. For example, children can program Dash to look left and right before crossing the street, perform a square dance, or act out characters in a story. Wonder Workshop’s Dash is a programmable robot that draws upon gender neutral-design to bring coding to life for students with age-appropriate interfaces and curriculum.